In deutschlandweit 240 Orten schneiden laut Verivox alle drei Netzbetreiber bei Sprachverbindungen „mangelhaft“ ab. Die meisten Funklöcher gibt es in Baden-Württemberg (63) und Bayern (52). Dagegen sind es in Sachsen nur zwei, in Thüringen vier Orte. Auch bezogen auf alle Städte eines Bundeslands schneidet Baden-Württemberg mit einem Anteil von 5,7 Prozent am schlechtesten ab. Am besten steht hier Schleswig-Holstein mit 0,5 Prozent da. 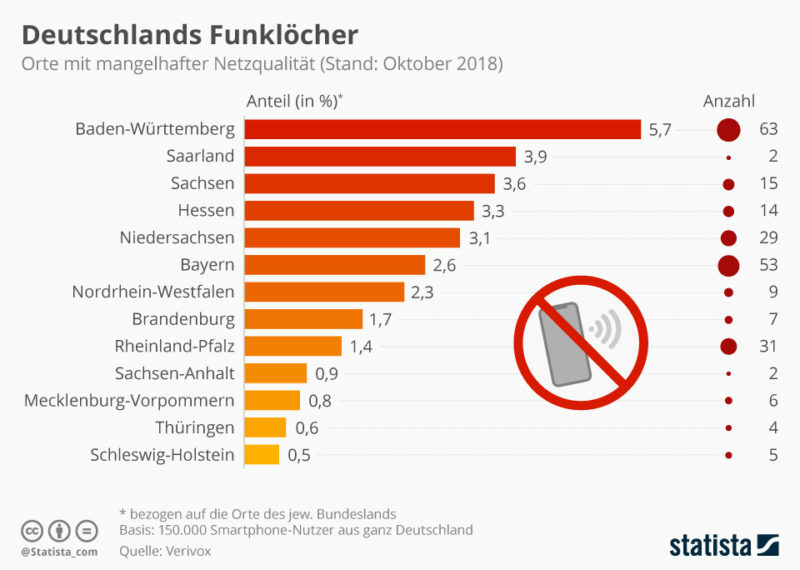 According to Verivox, all three network operators in 240 towns throughout Germany do “poorly” with regard to voice connections. “While with 5G the next mobile radio standard is in the starting blocks, the network supply over 4G is insufficient in many places”, says Jens-Uwe Theumer, Vice President Telecommunications at Verivox. “Not only in small villages or sparsely populated regions are telephone calls frequently interrupted or data connections not established at all: The cities with five-figure population figures are also among the poorly served villages”. Most of the radio holes are in Baden-Württemberg (63) and Bavaria (52). In contrast, there are only two places in Saxony and four in Thuringia. In terms of all cities in a federal state, Baden-Württemberg also comes off worst with a share of 5.7 percent. Schleswig-Holstein is best with 0.5 percent. Next story K.I. Revolution: Was denken die Wirtschaftsführer darüber? – A.I. Revolution: What Do Business Leaders Think?